Part I of this lab introduces the mechanics of crater formation and the morphology of different types of craters. The lab exercises in Part I utilize movies of impact experiments to demonstrate the formation and structure of impact craters. The diversity of crater morphologies is illustrated by images of craters. Every body in the solar system has been subjected to the impact of objects such as comets, asteroids, or accretionary debris. The Moon, Mars, and Mercury all have heavily cratered surfaces that are the result of tens of thousands of impacts. Most satellites in the outer solar system also display thousands of impact craters. These heavily cratered surfaces record the period of an intense, solar-system-wide bombardment that ended about 3.8 billion years ago. All traces of this period have been erased from the surfaces of the Earth and Venus because these two planets have undergone relatively recent activity, including tectonic, volcanic, and erosional activity. Since this period of intense bombardment, the impact rate has been about 100 times less. However, during the past 500 million years there have been several very large impacts on Earth that have affected the entire planet. Today, impacts from comets and asteroids still occur on all bodies in the solar system (Figure 1), including Earth. Meteor Crater (1.2 kilometers diameter, 183 meters deep, with a rim height of 30–60 meters) in northern Arizona was created by the impact of a 25-meter-diameter iron asteroid approximately 49,000 years ago. In 1908 a small asteroid exploded in the atmosphere over an unpopulated region of Tunguska in Siberia, creating an atmospheric shock wave so strong that it devastated a 10-km2 area. In July 1994, about 20 fragments of Comet Shoemaker-Levy 9 impacted the atmosphere of Jupiter and created atmospheric disturbances larger than Earth. Figure 1. New martian crater. A new crater (white arrow) formed in the western Arcadia Planitia region of Mars between June 4, 2008, and August 10, 2008. Image Credit: NASA/ JPL/MSSS. where m is the mass of the object and v is its impact velocity. Asteroids hitting Earth have impact velocities from about 11 to 25 kilometers per second (about 25,000 to 56,000 miles per hour). Very large amounts of energy are released by impacts because the amount of energy released is proportional to the square of the velocity. For instance, an iron meteorite 1 kilometer in diameter hitting the surface at a velocity of 15 kilometers per second will release more than 4 × 1027 ergs of energy, the equivalent of about 100,000 one-megaton hydrogen bombs. The crater formed by such an event would measure about 10 kilometers in diameter. In an impact event the motion of the projectile (meteorite or comet) rapidly transfers kinetic energy to the planetary crust. Most of this energy takes the form of shock or pressure waves that travel at supersonic speeds through both the surface and projectile. These shock waves spread outward beneath the point of impact in a hemispherically expanding shell (Figure 2). Figure 2. 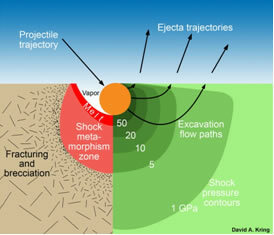 Diagram of the pressure field and flow of material in the excavation of an impact crater. The arrows show the upward and outward flow of material left behind the rapidly expanding shock wave. Ejecta fragments are initially ejected at a 45° angle. The green contours represent the peak pressures as the shock wave moves through the target material. The material lining the growing transient cavity is impact melt and the open area behind the impactor is vaporized target material. Ejecta near the impact site travels at very high speeds, whereas ejecta that emerges at greater distances travels at slower velocities. 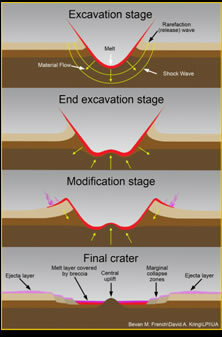 Image Credit: Illustration from an educational poster, Geological Effects of Impact Cratering, David A. Kring, NASA Univ. of Arizona Space Imagery Center, 2006. Modified from a figure in Traces of Catastrophe, Bevan M. French, 1998. The strength of the shock waves is so great that the rocks are subjected to enormous pressures. The interaction of the shock waves with the unconfined surface, called a free surface, is responsible for excavating the crater. After passage of the shock wave, the compressed rock snaps back along the free surface. This produces a tensional wave — called a rarefaction wave — that decompresses and fractures the rock, setting it into motion along fracture planes. The net effect is to momentarily convert the rock into a fluid-like material that moves laterally upward and out of a steadily growing excavation cavity. In the meantime, the projectile has been largely destroyed by shock waves generated within it. In general, impact craters have a raised rim with the floor at a much lower level than the surrounding terrain. Fresh craters are surrounded by low, hilly terrain and swarms of small craters caused by material ejected from the crater. The rim consists of an overturned flap of target material. The upper layers of the rim consist of material that originally occurred at a greater depth, and is therefore older. The deeper layers in the rim occurred at a shallower depth and are therefore younger. This is called inverted stratigraphy (Figure 3) because the age of the rim material gets younger with depth in the rim. Figure 3. Illustration of inverted stratigraphy. Image Credit: Modified illustration from Guidebook to the Geology of Barringer Meteorite Crater, Arizona (a.k.a. Meteor Crater), ©2007, David A. Kring, Lunar and Planetary Institute. LPI Contribution No.1355. Figure 4. Formation of a simple crater. Image Credit: Illustration from an educational poster, Geological Effects of Impact Cratering, David A. Kring, NASA Univ. of Arizona Space Imagery Center, 2006. Modified from a figure in Traces of Catastrophe, Bevan M. French, 1998 - modified from a figure in Impact Cratering on the Earth, Richard A. F. Grieve, Scientific American, v. 262, pp. 66-73, 1990. The size of an impact crater depends not only on the amount of energy released by the impact, but also on the gravity field of the planet or satellite, and certain properties of the projectile and surface rocks. For a given size impact, a larger crater will form on a planet with a weaker gravity field because it is easier to excavate the material. In all cases, a crater is many times larger than the projectile that formed it. Although the diameter of a crater depends on the complex interaction of many factors, a rough approximation is that the excavation crater will be about 10 times larger than the projectile that formed it. The depth of a crater is considerably less than the diameter. For example, simple craters on the Moon have a depth/diameter ratio from 0.14 to 0.2, i.e., the diameter is about 5 to 7 times greater than the depth. For complex craters on the Moon (larger than 20 kilometers in diameter), the depth/diameter ratio ranges from 0.1 to 0.05, i.e., the diameter is from 10 to 20 times larger than the depth. This is because slumping of the inner walls and formation of the central peak causes a shallower depth. 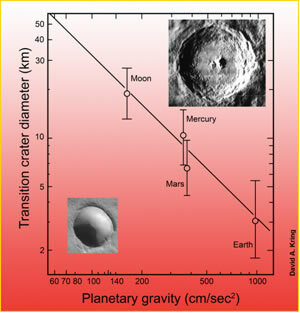 There are two basic types of impact crater, simple (Figure 4) and complex (Figure 5). A simple impact crater is bowl-shaped with no interior structure. The size of simple craters corresponds closely to the maximum diameter of the excavation cavity. However, at larger diameters, the crater begins to change form. This takes place at a critical diameter called the transition diameter (Figure 6), which generally depends on the gravity field of the planet or satellite. The transition diameter usually is smaller on planets with a larger gravity field. Complex craters have interior terraces and flat floors surrounding central peaks. In large craters the excavation cavity is enlarged by inward slumping of the crater walls. This produces terraces on the interior walls. The energy of impact is so great that a certain fraction of the impacted material is melted to produce impact melt. Some of the impacted material is vaporized. The flat floors are a combination of impact melt and broken-up floor material called impact breccia. The mountains near the center of the crater are called central peaks. The sudden excavation of a crater causes the rocks beneath the impact point to undergo a shift from very high to very low pressures in an extremely short period of time. This causes the center of the floor to spring back or rebound into a central peak. At large diameters the central peak develops into a peak ring. Very large complex craters have multiple rings that are caused by large sections of the crust collapsing into the enormous excavation cavity. Figure 5. Formation of a complex crater. Image Credit: Illustration from an educational poster, Geological Effects of Impact Cratering, David A. Kring, NASA Univ. of Arizona Space Imagery Center, 2006. Modified from a figure in Traces of Catastrophe, Bevan M. French, 1998 - modified from a figure in Impact Cratering on the Earth, Richard A. F. Grieve, Scientific American, v. 262, pp. 66-73, 1990. Figure 6. Transition diameters for the terrestrial planets and the (Earth’s) Moon. Image Credit: Illustration from an educational poster, Geological Effects of Impact Cratering, David A. Kring, NASA Univ. of Arizona Space Imagery Center, 2006. The Vertical Impact Stack file is a movie made of a stack of 24 individual images, or frames. It is a movie of an experimental vertical impact at the NASA Ames Research Center. This type of experiment uses small projectiles fired into targets, mostly composed of quartz sand, to simulate the physical properties of solid rock at very high velocities. The experiments take place in a vacuum chamber to simulate atmosphereless conditions. A projectile is fired from an ultra-high-speed gas gun at a velocity of 6 kilometers per second. Although the impact velocity is high by most standards, it is relatively slow compared to celestial body impacts, which mostly take place at velocities between approximately 10 and 72 kilometers per second. Nevertheless, experimental impacts such as these give us good insights into the formation of large impact craters. Open the Vertical Impact Stack file. The scale of these images is 1 pixel = 0.156 centimeters. Set the scale of these images; Analyze à Set Scale. Enter the measured distance as 1 pixel, and the known distance as 0.156 centimeters. Enter “centimeter” in the "Unit of Length" field. From the IMAGE menu, select STACKS à START Animation. [A shortcut to starting, and stopping, any movie is to press the \ (backslash) key. There are also controls for starting/stopping the animation, and stepping through the frames, in the right side of the ImageJ applet window. Click the double arrowheads (>>) and select Stack Tools.] Watch the movie. Notice how the crater's depth and diameter grow, and how the ejecta curtain moves. Slow down the movie to get a better view of the crater formation and ejecta curtain movement. Use the number keys (1–9) to run the movie at different speeds. (The higher the number, the faster the movie plays.) Next, cycle through the movie one frame at a time using the left or right arrow keys. Notice that each frame is numbered consecutively, with 1 being the first frame. 1. Compare the stages of formation of this experimental crater with those shown for a simple crater in the previous background section. a. On which frame of the experimental impact does the crater reach maximum depth? Measure the depth and record your answer. b. On which frame does it reach maximum diameter? Measure the diameter and record your answer. 2. Calculate the depth/diameter ratio of this crater. 3. On the second or third frame, measure the angle of the ejecta curtain with respect to the surface using the Angle Tool, and record your result. Close this stack of images. Open the Oblique Impact Stack file. This is another movie of an experimental hypervelocity impact in a vacuum chamber at the NASA Ames Research Center. This time the impact occurs at an angle of 30° from the vertical in order to show the effect of an oblique impact on the distribution of ejecta. Animate the stack, then step through the frames one at a time. Impacts that occur at angles to the surface form ejecta deposits that are asymmetrical, with most of the ejecta deposited on the downrange side of the crater. 4. On the second frame, measure the angle that the ejecta curtain makes with the surface on both the left and right side of the impact, and record your results. a. In what direction in the images was the projectile traveling? b. How did you reach this conclusion? 5. Is the shape of this crater different from a crater formed by a vertical impact? Explain your answer. Open the LO Crater file. This is an image of a small crater on the Moon taken in 1965 by Lunar Orbiter III. You will measure the diameter and depth of this crater and calculate the depth/diameter ratio for comparison with the depth/diameter ratios of the experimental crater and simple craters on the Moon. There are two basic types of impact crater, simple and complex. A simple crater is bowl-shaped with little interior structure. A complex crater has terraced inner walls, a central peak or peaks, and a flat floor. Simple craters on the Moon have a depth/diameter ratio from 0.14 to 0.2, i.e., the diameter is about 5 to 7 times greater than the depth. For complex craters on the Moon (larger than 20 kilometers in diameter), the depth/diameter ratio ranges from 0.1 to 0.05, i.e., the diameter is from 10 to 20 times larger than the depth. This is because slumping of the inner walls and formation of the central peak causes a shallower depth. In this image 1 pixel = 2.15 meters. Set the scale. 6. Measure the diameter of the crater and record your result. 8. Determine the depth/diameter ratio of this crater. a. Does it agree with the ratio for the experimental crater you measured earlier, and the ratio for simple lunar craters? b. What does this tell you about this crater? Open the Ammonius and Lambert files. Tile the images to make it easier to view both at the same time. Select Windows à Tile. These lunar craters where photographed by the Apollo astronauts in orbit around the Moon. The interior structure of each crater is very different. One is a complex crater and the other is a simple crater. On the Moon, the change from simple to complex craters is at diameters between 15 and 20 kilometers. 9. Describe the major morphological differences between the craters and state which one is simple and which is complex. 10. From the characteristics alone, which crater is the largest? Explain your answer. Cascade the images. Select WINDOW à CASCADE. The scale for the Ammonius image is 1 pixel = 0.038 kilometers, and the scale of the Lambert image is 1 pixel = 0.0835 kilometers. 11. Measure the diameters of Ammonius and Lambert. Do your measurements agree with your answer to question 10 above? Open the Meteor Crater file. This is a picture of Meteor Crater in northern Arizona. Its diameter is 1.2 kilometers, and its depth is 183 meters. The crater was formed approximately 49,000 years ago. It is the largest, most well-preserved crater on Earth. Relatively few (about 120) impact craters have been identified on Earth because they are rapidly erased by erosion and plate tectonics. Seventy percent of Earth’s surface is water, so many craters formed on the ocean floors and were quickly eroded. However, impact craters are well preserved on other planets and the Moon. This is the reason you have been studying impact craters on the Moon. 12. What type of impact crater is Meteor Crater? How did you reach your conclusion? 13. How does this crater differ from the same type of crater on the Moon? What are some possible reasons for these differences?